Brave, colorful for a good cause: The 340 Polar plungers and dashers gathered at the SIU recreation center to support the Special Olympics Illinois athletes. The American Marketing Association in the SIU College of Business recently chalked up another success in organizing the annual SIU Polar Plunge challenge. The event, presented by Law Enforcement Torch Run and GEICO, raises funds for Special Olympics Illinois athletes. To take part in the Polar Plunge, participants raise $100 in donations from friends, family, co-workers and others interested in supporting Special Olympics. In the past 17 years, more than $12 million has been raised by nearly 50,000 plungers statewide. The proceeds from the event benefit Special Olympics Illinois athletes. Carbondale serves as one of the locations taking part in efforts to raise funds for Special Olympics each winter. The American Marketing Association of the SIU College of Business has been organizing and co-sponsoring the event for the past five years. 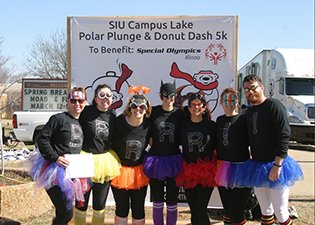 In 2015, another fundraising event was added to the Polar Plunge challenge: A 5K Donut Dash race introduced by the SIU Police Department. The competition helps to raise even more proceeds for the cause. The Donut Dash participants raise $30 to participate in the race and run a 5-kilometer route, along which they can stop at multiple stations to eat a doughnut. For every doughnut a runner consumes during the race, that runner receives a one-minute deduction from his or her overall time. On Feb. 27, SIU students and community members gathered at the SIU Recreation Center to cheer on the brave plungers and tough dashers in their efforts to support Special Olympics. Polar Plunge 2016 attracted 190 plungers and 150 dashers, raising $43,365. After the event, all plungers and dashers were invited to a Post Plunge Party at the SIU Rec Center, where they had a chance to win various prizes. In addition, all plungers were awarded an official Polar Plunge sweatshirt, while all dashers took home an official Donut Dash Performance shirt. Plungers also received additional prizes depending on how much money they raised for the Polar Plunge. Some of the registered plungers and dashers represented sports teams or student organizations. The SIU swimming and diving team took part in the Polar Plunge, as did the College of Business’ AMA team. In fact, the AMA team won the RSO Cup at Polar Plunge 2016 for raising the most money by a registered student organization or Greek organization, generating $3,200 for Special Olympics. The $500 award, which will help support the organization’s activities, was donated by TJ’s Fine Jewelry and The Underground. To make the event even more attractive and memorable, organizers rolled out other fun activities. There was live music throughout the day, a donation raffle, multiple doughnut stops, commemorative T-shirt and souvenir sales, Special Olympics Lottery ticket sales and a photo booth. None of this would have been possible without the AMA, the 100 volunteers who donated their time and effort to make the event a success, and the sponsors and donors. The top local sponsors included the Southern Illinois Miners, the Carbondale Police Department, Primo’s Pizza (which provided food for all plunge meetings and the Post Plunge Party), River Radio, Mayflower (which provided trucks where participants could change), WSIL News 3, Sam’s Club, the AMA, SIU Rec Center and others. Donors included TJ’s Fine Jewelry, The Underground, Southern Illinois Motorsports, McAlister’s Deli and many others. If either the Polar Plunge or the Donut Dash piques your interest, consider becoming a participant next year! For more information, please visit www.plungeillinois.com.